Joe Timmer joined the Grand Rapids Camera Club in 1966, and began his travels along the competition photography road.A master of manipulative, creative photography, known for using multi-exposures in his work. 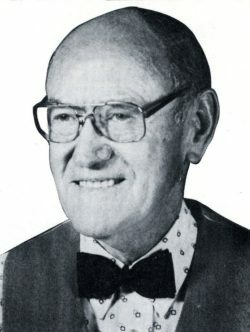 He competed in the international salons sanctioned by Photographic Society of America (PSA), earning 6000 acceptances and over 535 trophies, plaques and medals.In PSA’s “Who’s Who in Photography” Joe consistently ranked in the top 5 in both Nature and Pictorial slides.In a 1975 world competition, he was listed 10th in pictorial slides, 11th in nature slides and 4th in nature black & white prints.No PSA member ever placed so high in so many categories in one year. He was never one to keep secrets and gave lectures constantly.He was a multiple repeat lecturer to GRCC and to SWMCCC.He gave workshops traveling over the eastern United States and Canada.He does not accept any fee for such services, only travel, hotel and food expenses are paid.His slides and photos are better traveled than he, winning prizes in at least 25 countries. The most highly prized to him is the “Hands Across the Sea” award from Adelaide, Australia.